Welcome to the Sensation Nation. We offer recreation, athletic, therapeutic, and educational opportunities for those with different needs. We believe everyone should have opportunities to maximize their development, strengthen motor skills, and build self-confidence in a safe, nurturing, and natural environment. The Sensation Nation’s highly trained coaches work with the students on an individual and small group basis so the specific motor, behavior, and sensory needs can be addressed while building the child’s repertoire of recreational activities. All lessons take place in natural environments which offer great opportunities for peer modeling and social development, as well as provide the students with access to the typical environments that society has used as an important vehicle for child development for decades. At the various Sensation Nation locations, students will learn the fundamentals of gymnastics, ball and racquet sports, and other age-appropriate activities. The goals of each student are individualized depending upon their specific needs. We appreciate the opportunity to work with you and your child, and in order to provide the best service possible, there are a few policies and procedures that must be followed. Your cooperation is essential to your child’s success at The Sensation Nation. If you have any questions about your child’s program, please call us at 866-292-5290. We will be happy to assist you in any way possible. Once an on-site assessment has been completed, a written copy of the evaluation will be kept in The Sensation Nation’s main office. The more flexible your schedule, the more quickly your child will be matched with an appropriate instructor for sessions to begin. If no openings exist that correspond with your availability, your name will be placed on a waiting list, and you will be contacted when an appropriate session time becomes available. To comply with insurance and safety regulations, The Sensation Nation sessions include only those enrolled in the program. Please do not ask to involve your neighbors, friends, or other family members in the sessions. They will not be allowed to participate. Distractions to other classes can prove dangerous, so please help maintain safety by using the main entrance of the facility at all times. At all facilities, parents are asked to remain in the designated waiting area during the session, unless the coach or therapist asks for your participation. Please feel free to discuss details about the session with your coach after the class has finished. The final five minutes of each session are intended as an opportunity for discussion and questions. You are responsible for all charges accrued at The Sensation Nation. If the session has to end early, you are still responsible for the entire session fee. Payment is due in full by the 1st day of the month in which services are held. The Sensation Nation offers automatic credit card billing of monthly fees. If you would like to have your monthly fees automatically billed to your credit card each month, please fill out and return the attached Monthly Automatic Credit Card Authorization form. Each month, the amount will be automatically deducted from your credit card. The number of sessions each month will vary depending upon the calendar. If a customer elects to make payments via check, there will be a $5 processing fee per payment. Please do not hand your child’s coach, instructor, or therapist any payment for services. Mail checks to P.O. Box 28647, San Jose, CA 95159. There is no additional charge if the customer makes payments via automatic credit card billing. If a customer’s payment is late after a 10-day grace period, a Late Payment Fee of $25 will be assessed. Each hour session will last approximately 50-55 minutes (½-hour sessions in the pool last 25 minutes), with time after the session for the instructor to provide parent feedback and answer any questions. Please be sure that you arrive on time and that, if for some reason you need to leave the building, you return at least 10 minutes prior to the end of the session. This is to ensure your child is able to benefit from the entire allotted time and that your instructor’s next session can begin promptly at the beginning of the next time slot. Interns may be working alongside your permanent instructor as training is a very important process for every coach. Each facility has a sign-in sheet for The Sensation Nation. Please be sure to initial The Sensation Nation sign-ins for each session your child attends. This ensures that any discrepancies can be quickly and correctly resolved. Please ask your instructor where the sign-in sheets are located on your first session. Prior to and after your session you are responsible for your child. Children are not allowed to be on the equipment/in the pool or in undesignated play areas without an instructor of The Sensation Nation present. Per each facility’s request, The Sensation Nation parents are required to stay on the facility grounds if their child is being seen when no other classes are being conducted. Appropriate clothing assures comfort and safety and is required of all students of The Sensation Nation. Shoes and socks will be removed at the beginning of each session. Elastic waistbands are preferred. Absolutely no belts, hanging jewelry, baggy clothing, or jeans can be worn on the gym floor. Girls: leotards, stretch pants, close fitting sweatpants, shorts, and t-shirts. No tights or leggings with feet. Boys: shorts or close fitting sweatpants and t-shirts. If your child is not potty-trained, please have them wear diapers and bring an additional set of clothing. Plan to stay inside the building in case your child needs to be changed. Your session could be terminated if you do not have alternate clothing. Boys and girls should wear comfortable one-piece swimsuits, and bring a towel. Goggles are optional; parents may supply them if desired. If your child is not potty-trained or could possibly have a bowel movement in the water, swimmers (water diapers) must be worn at all times or your child will not be allowed in the water. All equipment must be brought to each session; no storage space is available. Comfortable clothing for each activity is acceptable. Appropriate padding and safety helmets are required for bicycling. Shin guards are required for soccer. Please ask your coach about proper footwear prior to start date. During the session, your child may be photographed and/or videotaped with the implied consent of the parent. If any of this information is distributed or published, The Sensation Nation will obtain prior written consent from the parent. 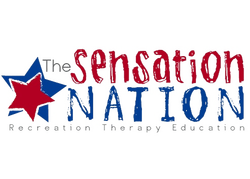 The Sensation Nation’s website showcases photos of children currently in The Sensation Nation program. No student names are used on the site. In addition, photos taken throughout the various programs are utilized in presentations to parents, gyms, pools, and workshops at which The Sensation Nation staff members are guest speakers. Consistent, on-time attendance will help create structure and foster the most beneficial learning environment. If you must cancel a session, please call The Sensation Nation main office at 408-292-5290, as well as your instructor, at least 24 hours in advance of your scheduled class. The Sensation Nation operates most of the year and remains open on many school and national holidays. Please check with The Sensation Nation office and with your instructor if your regularly scheduled session falls on a holiday. Makeup sessions for individual gymnastics sessions can be scheduled directly with your coach or through the main office. You are allowed three (3) per year, scheduled within 4 weeks of absence. The Sensation Nation encourages you not to cancel appointments unless absolutely necessary. Consistent attendance ensures the continued progress of your child in the program. Of course if your child is sick (severe cold, fever, flu, etc.) please don’t bring him/her to class, as not to expose other families and coaches to any contagious illness. Your child may be sent home early if an instructor decides that he/she is too sick to complete the session. Makeup sessions for the pool will only be offered if the instructor has to miss the lesson and there isn’t a substitute available to teach your child. There are no makeups for the group sessions. If you cancel a session less than 24 hours in advance, you will be billed and no makeup will be given. This is to ensure our client attendance and cover our facility operating costs. If you sense your child is getting sick, please call immediately. Unfortunately, we are still obligated to bill without a makeup if the main office receives the call less than 24 hours in advance due to illness. Although we recognize emergencies and illness do occur, The Sensation Nation coaches are left unable to adjust their schedules accordingly. If you have a scheduled absence (vacation, doctor’s appointment, etc.) you must cancel the session by notifying The Sensation Nation main office (not the facility itself) as well as your coach. For an excused absence you may schedule a makeup. There are no makeups for the group sessions and the pool program. The Sensation Nation doesn’t run concurrent with school holiday schedules. Please check with your instructor to find out if The Sensation Nation will be closed for certain holidays. Notify The Sensation Nation main office at 866-292-5290 for any absences 24 hours in advance. Notify your instructor as well. Each instructor should provide you with a phone number for getting in contact with him/her directly. Should you decide to discontinue The Sensation Nation’s services, all cancellations must be in writing. In order to stop the next month from being charged automatically, we must receive your written cancellation or email 30 days in advance. Please be sure to include the last date of your class. If canceling prior to the last class of the current billing period, no credits or refunds will be provided for any unused tuition. No exceptions.